Eager to start a new phase in life, Rahul Saxena, 27, a half-Indian British citizen, recently out of job and rejected in love, lands in Mumbai from London to study filmmaking. But little does he know that Mumbai, the city of dreams, will turn his life inside out. From the dark corners of the streets as a professional rat killer to the vermin-infested confines of a jail, from shady dance clubs to the homes of Mumbai’s rich women where he is paid to provide pleasure—fate takes him on a roller-coaster ride that challenges his very will and determination to survive. When his secret life threatens to destroy even the love that he finds, Rahul seeks recourse in spirituality. Inspired by India’s synergetic religious traditions, Rahul fights back internal and external demons to write his own destiny. One Enduring Lesson is a tale of the undying human spirit of survival against all odds. In my school days in Zanzibar, Tanzania I used to write scores of essays. So writing was a habit for me from my young days. In 2009 I came up with the idea of writing a novel. I had a great original story in mind, but had no idea of how to write a novel. I had to self-tuition myself in the art of storytelling, scene construction, dialogue development and creative writing. To do this I started reading novels written by famous novelists and also started watching films. In all I read 75 novels and saw 260 films. I also attended two short courses in London in creative writing. I made extensive study notes from all these resources. The story is based in India. I did extensive research on many aspects of life in India and issues covered in my novel. In all I had 235 print-outs on various subjects to read and draw knowledge from. 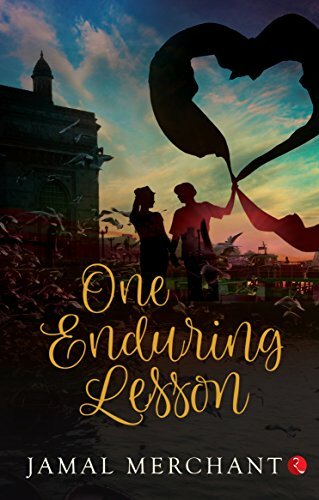 In January 2011, I made a special trip to India and visited Mumbai and Amritsar and visited all the places in these two cities where the action takes place involving the protagonist Rahul Saxena. It was a fact-find visit which greatly assisted me in describing some of the places and events in my novel. I used to get up at 4.00 in the morning to write. As a debut novelist, it was a slow and painful process. But I persevered and completed my first draft in September 2011. I sent the synopsis and a few sample chapters of my novel to a few literary agents who all rejected the same. In all my novel was rejected by some 40 literary agents and publishers. I realised my writing was not up to the standard. I therefore re-visited all my notes and started to edit my work and re-wrote many parts of it. I enriched my draft with scores of improvements and new ideas, culminating in a draft which was finally accepted by Rupa Publications of India. The editing process continued even after my novel was accepted by Rupa who finally published the book in August 2017. I will write another novel only if and when I have another brilliant and original story coming to my mind. Sample chapter – You can visit Amazon and “Look Inside” to read the first chapter to get an idea of the writing and the family dynamics of the protagonist Rahul Saxena. The book has received 5 Star Reviews in Amazon and independent book review blogs.